If there's one style motto I live by, it's "Dress for comfort." And that's what Lou&Grey is all about. Whenever I go into my favorite stores I take time to touch each piece of fabric — feel the weight and texture of it between my fingers to make sure that tee shirt or pair of pants will be comfortable and help me feel my best. Last week I stopped by my go-to Lou&Grey at One Pasadena to pick out some new summer pieces (their Garment Dye collection is amazing!). Every time I shop there, I am always blown away by the beautiful interior, super-soft textiles, and friendly salespeople. And did I mention how cute the dressing rooms are? While I love the warmer weather, I don't always love summer clothing. I'm just not the biggest fan of shorts, and when the temperature climbs into the 90s (or even 100s), I usually end up feeling uncomfortable in anything I wear....until I found these two beautiful linen pieces from Lou&Grey's Garment Dye collection. The answer to staying comfortable AND on-trend this season is these Linen Pants and Shadowstripe Double V Top. I love how monochrome, lightweight, and simple this look is — both pieces look amazing together, and each can be dressed up or down with simple accessories. For a casual day in the desert, I wore this look with a a couple layered necklaces and a pair of mules. Simple and comfy as it gets. And here are a couple other of my favorite pieces from the collection: The Tie-Up Blouse and Softstretch Linen Pants. This whole "spring forward" situation has me thinking Summer break is right around the corner, when it's really still three months away. While I wait for sunny weekdays spent brunching and exploring, Sunday's in this off-the-shoulder dress will have to suffice. Every Spring I go on a search for the perfect white dress to wear throughout the Summer months. This year my search was completed the second I found this off-the-shoulder bow sleeve dress from Poshsquare. I love pieces that incorporate fun details into a familiar silhouette or textile. This dress is understated while also being playful — a minimal sheath cut with an updated sleeve. I kept the styling simple with a pale pink cross body bag and white converse. I don't wear heels too often (it's best to stay away from heels when you're accident-prone, like me), and I liked that the Converse kept this look cool and youthful. Because this dress is so clean and versatile it lends itself to being styled in so many different ways! I'm already planning my next weekend out just so I can wear it again. Next time I'm thinking of wearing it with my favorite western-style belt, and a black hat, and some silver-studded ankle boots. The possibilities are endless. While I enjoy having a busy schedule, I love using my free time during the weekend to grab food with friends, catch up (read: binge watch) shows, and maybe even drive down to Palm Springs. Given that my weekdays get so hectic, Saturday and Sunday often end up being the only days I wear something besides jeans and a t-shirt. I still prioritize comfort and simplicity, but brunch and dinner plans provide an excuse to show that I own more than two articles of clothing. I recently added some pieces from Poshsquare's Spring/Summer collection to the mix, one of them being this trumpet-sleeved top. To be frank, I've never been one to "follow trends." When someone tells me "ruffles are in," or "off the shoulder tops are big," I am usually unaffected, only purchasing pieces I love and can see myself wearing for a long time. I think statement sleeves were a trend that I never acted on when they were big (pun intended) and now I've finally hopped on the band wagon, roughly 9 months later. I love this top because it's slightly dramatic, while also being simple enough to wear out to casual events. I originally contemplated wearing it with my favorite vintage Levi's, but settled on black jeans and my new Zara block heels (my current obsession) for a more put-together look. 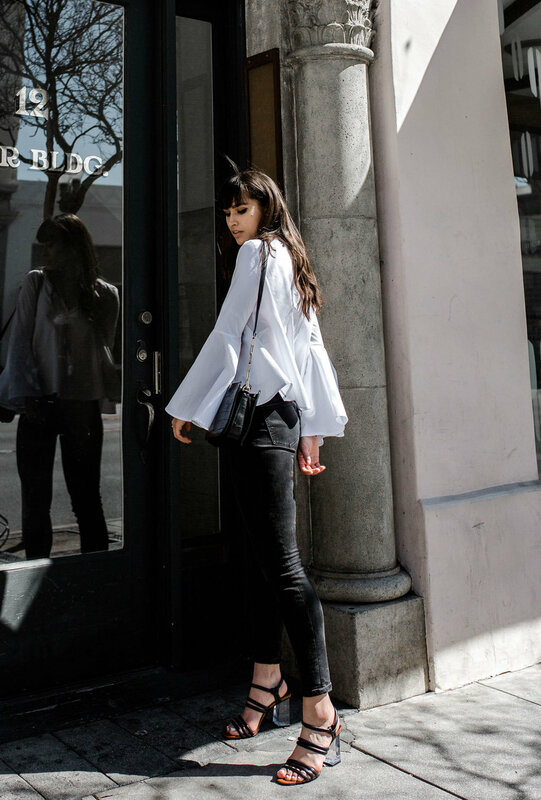 This is essentially your classic white-button-up-and-jeans look, but with a modern twist thanks to billowing sleeves and a playful silhouette. Just as well — I've never been the biggest fan of button ups (they look awkward on me), and this piece strikes the perfect balance between comfy and dressy, timeless and modern. This post was sponsored by Poshsquare. The last two people I've met from Instagram have told me that I'm taller in person than they expected me to be. This makes me happy, but also causes me to wonder if everyone who knows of me via the internet thinks I'm 5'1". I know I shouldn't complain. I'm 5'7", which is taller than average, but this does mean that I need to start taking my photos from lower angles. After a couple months of doing that I'll probably have people from Instagram say I'm so much shorter than they thought I would be. You can never win. In the Summer and Fall of 2015, I took a semester off of school to focus on my well-being and spend time doing things I had never allowed myself to do. Without any academic responsibilities, I was free to spend a period of about 10 months doing whatever I wanted. I've always liked working, so I got a part-time job, but for the most part my days were spent exploring the city, eating good food, enjoying quality time with family, and meeting people off of the internet. I had always been somewhat introverted — I never had many friends and I tended to keep to myself rather than engage in social activities. But meeting people off of Instagram was an opportunity to make friends with similar interests and learn more about the industry that I had always been interested in, but never given myself the chance to delve into. When I returned to school the following Spring of 2016, I took on a full schedule of classes, work, and content creation, leaving little time to meet up with people as I had during my semester off. Fast forward a year to Spring 2017, and I've met only a few new people in the past 12 months. I'm so busy every single day, going nonstop from sunup to sundown, that my own creative career has taken somewhat of a backseat. Thinking about what I want to accomplish this year, and where I want to be in the next 5, 10, 15 years, I decided that I need to be more proactive about my creative goals. I want to meet more talented people, collaborate with more incredible brands, and learn more about the industry. I was so happy when I got to meet Mire, an extremely gifted photographer based in Downtown Los Angeles, for coffee and a quick photo session. Even though our aesthetics are a bit different we were able to work together to produce some amazing content. After getting to know each other and discussing our creative goals we set off to shoot some photos around the Arts District. Instead of sticking to the usual white wall backgrounds I tend toward, we found a cool grid wall, as well as a multicolor steel fence. My outfits may stay the same (Blue jeans, black shirt, black boots. Same old, same old), but I'm committed to learning, growing, and improving my work. I don't want to get stuck in a minimalist rut where I'm scared to post anything without a plain background. I want to try new things, be inspired, experiment without fear of failure. As a college student it can be challenging to find high-quality pieces that are within my price range. My wardrobe usually goes a few months at a time without updates. When partnering with brands I'm always hoping that their offerings are within the average college student's budget. With Christmas, Hanukkah, Kwanza, and any other winter holidays you might be celebrating just a couple weeks away, the stress of gift-giving means extra strain on everyone's wallets. A classic Christmas gift for siblings, parents, and friends is a sweater. If you think about the stereotypical Christmas sweaters grandmas knit, a sweater might not seem like that great a gift. But if you actually think about all the things you can wear a great basic sweater with, it starts sounding like a much better idea. So let's say you decide to get sweaters for your mom and aunt. You go online and are confronted with cashmere sweaters priced $200-$500. How on earth is a full-time student with a part-time job supposed to be able to afford that, and all of the other gifts she plans to get? Let me first say that the Holidays aren't all about how much money you spend on presents. It's a season of giving, but giving can come in a lot of forms. You can give your time, your love, your friendship, and your words. If you do plan on buying presents, make sure to keep in mind that quality is more important than quantity. I usually give out a mix of homemade and store-bought gifts! You don't have to spend all your savings to show the people you love that you care. The good news is that you can still get your mom that beautiful cashmere sweater, without breaking the bank. Grana is an online shopping destination with the primary goal of producing high-quality basics at low prices. At Grana, the best textiles are sought out worldwide, and designs are produced in-house to keep costs down. I partnered with the brand to showcase three of their pieces — the cashmere crewneck sweater, silk ankle pants, and silk loose shorts — each under $100! As a self-proclaimed simpleton I'm always looking for the perfect wardrobe basics that are comfy, without looking frumpy. These three pieces are the perfect new additions to my wardrobe. Both of the silk bottoms can be dressed up or down, and the cashmere sweater is perfect for layering during winter. To get free shipping and 10% off your order at Grana through January 2017, use my code "CAITLINxGRANA" at checkout.